I love a good deal and Stampin’ Up! has a great deal going on right now for new Paper Pumpkin subscribers! 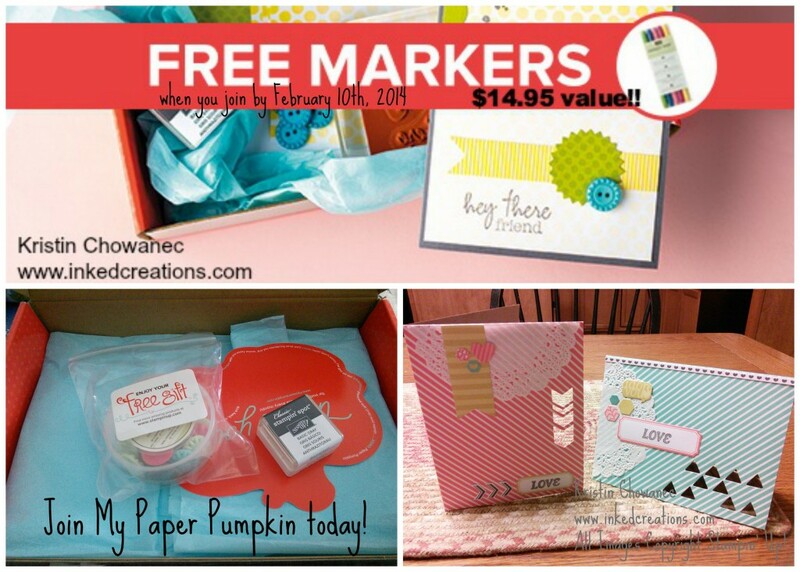 They are giving new subscribers a free set of In-Color Markers when you subscribe before midnight on February 10th, 2014! Make sure when you sign up you have me (Kristin Chowanec) selected as your demonstrator so I can send you a thank you gift! I know you will love My Paper Pumpkin as much as I do! • I’m $19.95 (and shipping is covered). I’ll arrive monthly. • I’ve got all the stamps, ink, paper, and accessories to create pinable projects. Projects like cards, journals, décor, and more! • I’m all cut, measured, and ready—with instructions included. • I’m a new and exciting surprise every month. For more information and frequently asked questions on My Paper Pumpkin kits check out my page.